Here you will find a variety of poly and structural foam basin packages for drainage and sanitary applications. 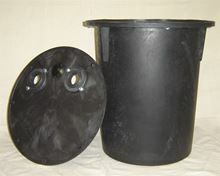 Basin holds 22 gallons. Cover is solid (non gas tight) and bolts down.